From left: Windy, Jake and Hope enjoy a sunny day. One disadvantage of having a wiener dog is he is low to the ground. In summertime, this can be a problem. Heat from concrete, blacktop, etc. will affect your dachshund faster than a taller dog. 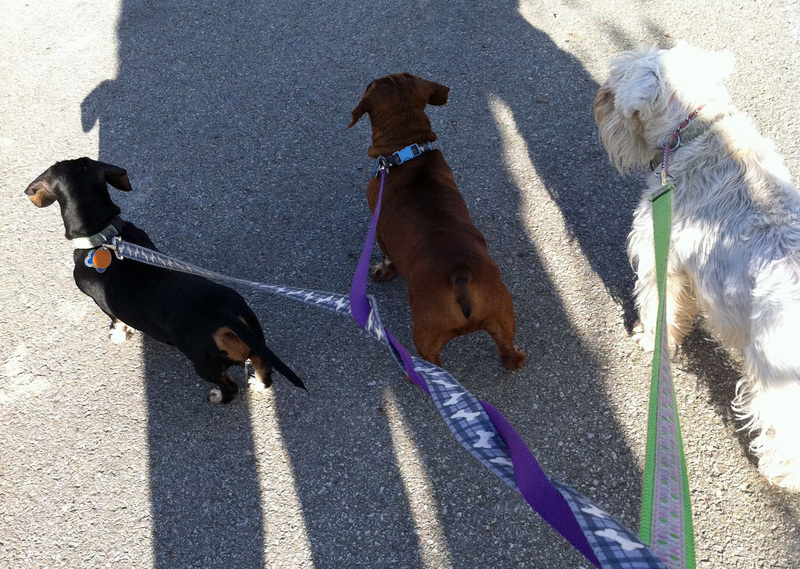 If you walk your wiener, please go early in the morning or after sunset, and try to keep her on the grass. My dachshunds are hearty souls, but they don’t know their limits. Don’t let them push themselves, and some will do so just to please you. As for schnauzers, if they have the traditional cut, they can get hot and need to cool. Some folks dispense with the traditional cut in summer and have them clipped close all over. I make sure a schnauzer doesn’t get overheated. Hope had another round of chemotherapy this week and is doing well. This time she was curious about her surroundings, the oncology vet said, and she did some exploring—as opposed to wanting to hid under a table. Hope now can go to one treatment every two weeks. Her hair loss has eased. She has not vomited or had diarrhea. The oncology vet said dogs tend to tolerate chemo better than humans. Thanks again for all the prayers. Please keep them coming. This entry was posted in Dachshunds, Dog Health, Schnauzers and tagged Cancer, Dachshunds, dog health, Schnauzers, Walking, Walks. Bookmark the permalink.